Mark Dochterman, director of the University of Illinois Springfield Volunteer & Civic Engagement Center, is the winner of the 13th annual Chancellor's Academic Professional Excellence (CAPE) Award. The award was presented by Chancellor Susan J. Koch during a ceremony on April 28, 2016. Dochterman joined UIS in 2011 and has also taught as an adjunct instructor in Experiential and Service-learning. 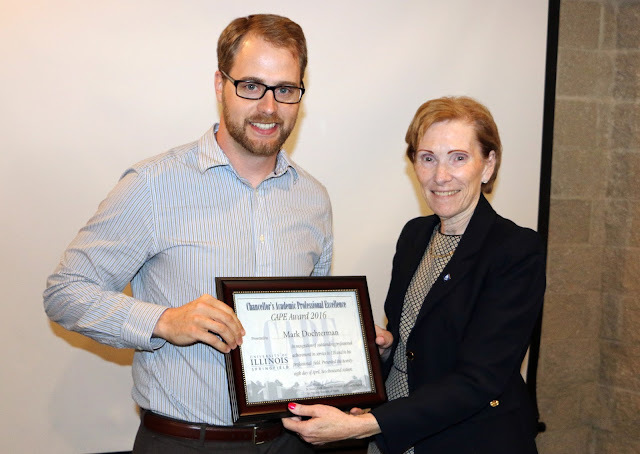 He recently led the launch of the new Collegiate Link software program, known on campus as UIS Connection, in fall 2015. “Recognizing a need for students, faculty and staff to be able to effectively plan, market and access campus activities, Mark brought together a team of staff from numerous campus offices/departments to study, select and implement the program,” said his nominator. Since the launch of Collegiate Link, the program is already seeing success with over 85 student organizations actively posting over 1,000 campus events. Students also now have a record of their involvement, as the program automatically logs attendance at events. “The implementation of this program only scratches the surface of Mark’s contribution to UIS in that he serves on a number of committees, advises numerous student organizations including Alternative Spring Break, Dance Marathon and Leadership for Life and continues professional development by attending conferences and workshops such as the American Democracy Project nation conference. Mark is truly deserving of this honor for his efforts,” said his nominator. Dochterman has also led the Springfest Service Project, the Martin Luther King Jr. Day of Service and weekly service projects for students through the Volunteer and Civic Engagement Center. He also chairs the Springfield Good as Gold volunteer awards ceremony and is the arrangements chair for the Central Illinois Volunteer Conference, which is held annually at UIS. Others nominated for the 2016 CAPE Award include Lori Benedict, Tammy Craig, Brian Hodges, Kathryn Kleeman Lesniak, Heather Nielsen, Mae Noll, Lynn Otterson, David Racine, Donna Schaub, and Teresa Szabo.